With Easter just around the corner, there’s no better time to break out the Easter decorations and hatch a plan to transform your home with springtime décor. If an Easter home transformation sounds impossible at this stage of the game, have no fear; I have a room by room approach to bring a little spring into the most important gathering places in your home. Start in the kitchen, where the egg dying magic happens. While kids take hardboiled eggs from the egg cooker and dunk them in vibrant colors, start exchanging everyday oven mitts, chair pads, towels and trivets for ones covered with Eastery flowers and butterflies. The pastels within the designs contrast beautifully with the finished Easter eggs—brilliantly presented on an expansive egg plate or within individual egg cups. With egg appetizers prepared, it’s time to start setting the table. Easter decorations can take the form of place settings; the dinner is the main portion of the event after all. Let table linens run the length of the tabletop, adding flower and butterfly flourishes to the space. Bring the same fresh breath of springtime to lovely napkin rings. 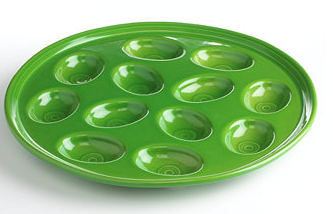 The serveware that fills the area can mimic the same designs. From pitchers to plates, keep the garden theme alive. Let place setting mugs and bowls feature the same floral designs as the casserole dishes that sit centered on the spread. Decorate each wine glass with the sweet touch of an added Easter charm, reused after the event on a bracelet. Equally cherished but able to be shared, try out salt and pepper shakers in the form of ladybugs, dragonflies, bumblebees or turtles. For a final touch, create a lovely centerpiece. Stick with the traditional, creating an Easter basket full of eggs, a vase of lilies, or a crystal cross at table center. Crosses make the perfect Easter decorations for other spaces in the home as well—like an entryway. In the foyer, framed art can bring in the holiday spirit. Deck the walls with photographic prints, like an eggshell cracked from a chick emerging. Depict animals themselves by placing figurines on tables around the house. Create a menagerie of frogs and turtles, snails and ladybugs, butterflies and dragonflies. Yellows, greens and pinks abound in standalone flowers or ones adorning adorable bunny figurines. Find the same palette in chick or sheep piggy banks. Lambs make another appearance when stuffed toys grace the Sofa or other family room seating. 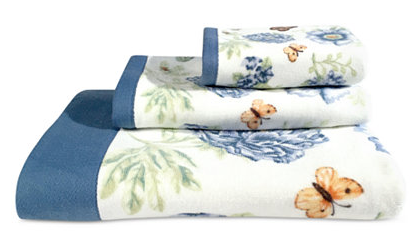 Soft as plush but a bit more functional, bring Easter decorations into the powder room with ducky Hand Towels. The theme descends to the floor with an area rug of the same design. Sprinkle the Easter spirit all over the home. Hop down the bunny trail to Macy’s to hunt for decorations this Easter. And if you’re looking for the perfect Easter outfit, don’t forget the 5 Day Wardrobe Sale is going on right now too!